“Fall down seven times, get up eight,” goes the Japanese saying. 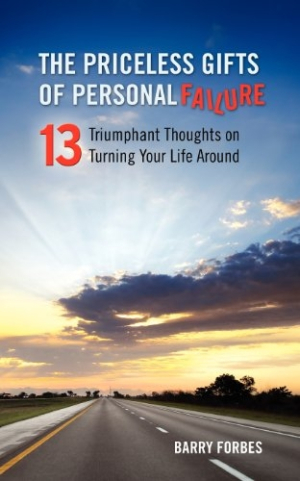 In The Priceless Gifts of Personal Failure: 13 Triumphant Thoughts on Turning Your Life Around, Barry Forbes uses this type of wisdom to encourage his readers to turn their failures into successes. The back cover summary touts the volume as “a roadmap from darkness to light,” but there is little direct instruction here about how to actually recover from personal failure. Instead, the book describes how personal failure feels and how people fail again and again by not accepting responsibility. The solution, Forbes tells the reader, is to forgive oneself and others and to be more giving and charitable. Each chapter begins with an anecdote or a quote and then ends in a “triumphant thought”: a sound-bite-sized summing up of the chapter’s advice. Forbes only briefly defines personal failure, and when he does the definition is rather fuzzy. According to him, personal failure can take one of several forms: not living up to our own or our loved ones’ fair expectations, deliberately or recklessly hurting another person, causing any pain or suffering to ourselves, or choosing to act in a way that “separates us from God.” With such a vague description, it is difficult to understand what does and does not count as personal failure. One gets the impression that this definition allows Forbes to decide what qualifies as the personal failures of others and to complain about everything he sees wrong with the world. Glaringly missing from the book is Forbes’s own experience of personal failure. Readers will have a difficult time taking inspiration from a narrator who won’t share his own experiences relating to such a personal topic. Another problem is that nearly the entire text is written in the second person, which, while perhaps unintentional, makes the book sound accusatory. “On the road of life, you will trade light for darkness, freedom for slavery, and hope for despair,” Forbes writes. “In the midst of your abject misery, you allow yourself a few, rare, reflective moments when you wonder, Is this all there is? Is this all I can expect?” Some readers—especially those who are truly in the midst of failure—may feel they are being reprimanded as opposed to supported. Nevertheless, there are some standout moments when Forbes reminds the reader of valuable truths. These include observations about how contemporary culture is at odds with finding true happiness—how it focuses on wealth and status and pulls us out of close relationships. The book is at its strongest when it examines real-life examples of personal failure, such as World War II veteran Og Mandino’s story. Those who find motivation in self-help books with a religious undertone might be galvanized by Forbes’s exhortations. Readers who need more concete advice, delivered in a more positive way, should keep searching for the support they are looking for.